The Red devil cichlid is an energetic and aggressive Central American cichlid that will add beauty as well as action to your aquarium. Due to its violent tendencies, it should however not be combined with small fish or peaceful species that can’t fend for themselves. Small fish will be considered prey by this relatively large predator. The Red devil cichlid can instead be successfully combined with equally large cichlids with a similar temperament. Keeping it with other Central American and South American cichlids is common. The family Loricariidae (Suckermouth Armored Catfish) and the family Pimelodidae (Long-whiskered catfishes) contain several suitable tank mates for the Red devil cichlid. You can also choose some of the bigger species in the family Characidae. If you want to breed your Red devil cichlids it can however be a good idea to give them their own separate aquarium since they will become highly aggressive when during the breeding period. You will find the Red devil cichlid in the genus Amphilophus in the family Cichlidae. The scientific name for this species is Amphilophus citrinellus. The Red devil cichlid is also known as the Lemon cichlid and the Midas cichlid. 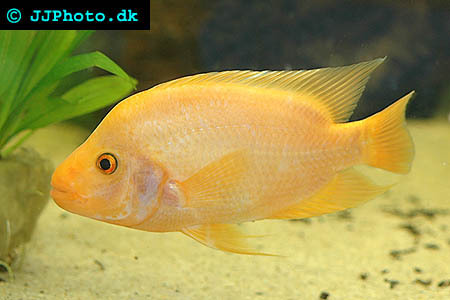 Simplifying the name Red devil cichlid down to just “Red devil” can cause confusion, since the related species Amphilophus labiatus is sold under this name. In its native region in Central America the Spanish speaking population will refer to the Red devil cichlid as the “Mojarra rayada”. The elongated and laterally compressed body of a Red devil cichlid can grow up to 30 centimeters (12 inches) in length and ends in a fan-shaped caudal fin. The dorsal fins are pointy. Just like many other cichlid species, the Red devil cichlid has a concave forehead and the males develop distinct cranial lumps. The mouth is a bit undercut and has big lips. The eyes are comparatively small. There exists a wide range of different color variations in Red devil cichlids, and two Red devil cichlids from two different geographical regions can display very dissimilar colors. 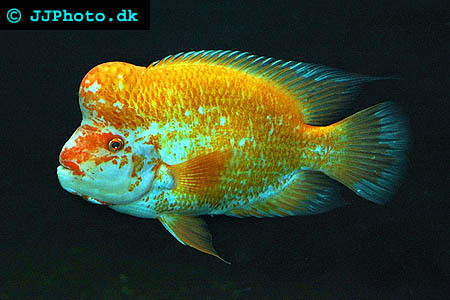 You can for instance get a yellow Red devil cichlid, an orange Red devil cichlid, or an orange-red Red devil cichlid. There is also a small number of white Red devil cichlids to be found. Roughly 10 percent of the Red devil cichlids are xanthomorphic and will alter their coloration as they grow older. The Red devil cichlid originates from Nicaragua and Costa Rica, but has been introduced by man to several other parts of the world. Its original range is found from 15° N to 8° N, and from 23 to 33° C. Its home region includes the San Juan River drainage and Lake Masaya, Lake Apoyo, Lake Managua and Lake Nicaragua. It is not a common species in Central American rivers, but it can swim into rivers if the water is calm or flows at a very gentle pace. The Red devil cichlid is not included in the IUCN Red List of Threatened Species. In the United States, you can today find introduced populations of Red devil cichlid in Florida (Black Creek Canal, Dade County) and Hawaii (the O'ahu reservoirs). In Singapore the Red devil cichlid can be found in slowly flowing freshwater canals as well as in brackish waters, which is quite strange since no Red devil cichlids have ever been caught in brackish water in its native region in Nicaragua and Costa Rica. Since the Red devil cichlid originates from tropical waters, it will need a water temperature from 21 to 26° C (70 to 79° F) in the aquarium. The preferred pH value is 7.0, but the Red devil cichlid can usually adapt to water conditions from pH 6.0 to pH 8.0. It will also tolerate a dH from 6 to 25, but trying to keep the dH close to 10 is recommended. If you want to coax your Red devil cichlids into spawning, you might need to adjust the water temperature. You can reed more about Red devil cichlid breeding further down in this article. As mentioned above, the Red devil cichlid can grow up to 30 centimeters (12 inches) in length and you must therefore be prepared to get it a large aquarium. As long as the fish is below 20 centimeters (8 inches) in length, a 122 centimeter (48 inches) long aquarium will usually be enough, provided that it has a capacity of 55 gallons (209 liters) or more. The aquarium must be decorated in a way that leaves a big area open for swimming. You should also create a number of sheltered spots for the Red devil cichlid, e.g. by including stones, caves and roots in the set up. Since the Red devil cichlid can be a prodigious digger, it is advisable to place any heavier object directly on the aquarium glass to avoid accidents. Live plants can be destroyed by the Red devil cichlid, so if you wish to arrange a planted aquarium I recommend really sturdy (and inexpensive) plant species. A Red devil cichlid spends most of its time in the lower part of the aquarium. The Red devil cichlid is an opportunistic predator that will eat a wide range of different food in the wild. Even though it is chiefly carnivore, it will need plant matter in its diet. If you keep your Red devil cichlid in an unplanted aquarium, it is even more important that you regularly include lettuce, boiled peas or similar in the diet. A varied diet is recommended. You can for instance use a high-quality pellet food for predators as a base, and supplement it with fish, earthworms, snails and insects. Aquarists with previous experience with cichlids and cichlid breeding typically find the Red devil cichlid quite easy to breed. As with any fish, the best preparation is to keep your Red devil cichlids in a large and decorated aquarium with ideal water conditions, and feed them suitable food. An increased water temperature can induce spawning in Red devil cichlids, so increasing the temperature to 24-28° C (75-82° F) is a good idea. Sexing mature Red devil cichlids is not hard, since the adult male Red devil cichlid develops a prominent bump on his forehead and has a pointy genital papilla. The male is also typically bigger than the female. The Red devil cichlids form monogamous pairs and both sexes participate in the raring of their offspring. Before any spawning takes place, the male can be very aggressive towards the female. It is therefore important that the female have many suitable hiding spots in the aquarium. You can also include a net in the set up with an opening that is too small for the male Red devil cichlid to swim through. If the female have no place to escape in the aquarium, she can die of injury or become severely ill from the stress. The [b[Red devil cichlids[/b] should be provided with a suitable spawning slate in the aquarium, such as a pane of glass or a flat rock. In the wild, the Red devil cichlids usually choose rocks, logs or the ceiling of a cave as breeding site, and will therefore naturally appreciate such objects in the aquarium. The female will deposit up to 1000 eggs at the breeding site during each spawning. Do not remove the parents from the aquarium when the eggs have been fertilized, since both parents participate in the raring off their young ones. The male will protect the territory while the female stays near the eggs and tend to them. The parents will dig a pit in the substrate and when the eggs hatch after approximately 3 days, the emerging larvae will be moved to this pit. The newly hatched offspring will feed on mucus extracted through the skin of the adult fish. The parents will continue to guard their offspring, and after roughly five days the fry is large enough to start swimming around in the aquarium. You can now start to feed the fry small live food.